Microfibre towels are small, lightweight, and fast drying! 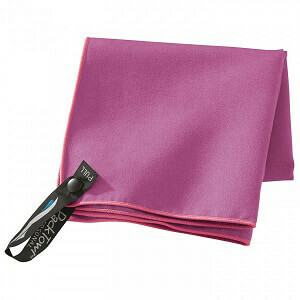 Travel towels comprises many favorable features a towel should have. They dry quickly and come in different sizes that suit every taste. This is why outdoor enthusiasts prefer them to regular towels. Moreover, you can easily use trekking towels for longer visits with your family and friends as they only require little space in hiking backpacks and fit in every travel bag. The micro-fiber structure of these towels can absorb water to a multiple of its own weight, which allows you to rub your body perfectly dry. This material is particularly popular among swimmers for it can be wrung out easily and carried in a bag without soaking it. Of course, the micro-fiber structure is also fit for trips around the world, backpacking, camping, or for excursions with little equipment. The towel is compressed in a small pouch which can be attached to your backpack or put inside. Travel towels made of cotton or synthetic fibers are machine-washable at high temperatures. Most outdoor towels are not suitable for boiling. However, thanks to modern detergents and the towels' antibacterial structure, lower temperatures will suffice to wash them perfectly clean. Moreover, they can be wrung out until they are relatively dry, which will keep your backpack from getting wet and starting to smell. Nonetheless, you should hang them up for a few hours and let them dry. This also applies to cold and rainy weather. In order to produce easily stowable travel towels, manufacturers started using micro-fiber fabrics. Apart from other advantageous features, they dry considerably faster than regular 100% cotton towels. And yet, many people say that trekking towels don't come close to the comfort of the terry towels at home. This may be true, considering that outdoor activists like to make cutbacks in terms of comfort and luxury in order to save weight. However, manufacturers adapted their products to the demands of their customers. Today, many trekking towels come in part-cotton fabrics and with raw surfaces that feel like terrycloth.